Apple Music’s overhaul was finally unveiled at WWDC on Monday, and the general consensus is that the update is much-needed and overdue. The music streaming service is only a year old, and, as announced on Monday, now has 15 million users. It’s still behind Spotify, which counts 30 million paid users as of March 2016. But the platform, once touted as a Spotify killer, had been plagued by complaints since its debut. Many users found the interface confusing. Some had problems differentiating between their own music and songs available for streaming. And the “Connect” tab, designed to allow users connect with artists, was widely criticised and deemed useless. The redesign includes a “downloaded music” section that will hold all music owned by users, the “Connect” tab has been hidden under a “For You” discovery tab, and the design seems easier to navigate overall. Reactions across social media seem pretty positive. But many users say this functionality should have been in the original version of Apple Music. The girl who did the Apple Music was awesome! (Comparing to last year, 10x improvement) ???? Apple News and Apple Music both redesigned after just one year. Clearly, someone got it wrong last year. @SpenceWasHere Already using Apple Music myself ???? It definitely needed an overhaul, so I’m excited ???? But of course, not everyone is happy with the new design. A lot of users are unhappy with the large, bold font. Apart from the font weight, looks like a much better redesign of the app. Good job Apple Music team. lmaoooo this Apple Music redesign is absolutely terrible. Apple really dropped the ball on the Apple Music redesign… yikes. That said, the real star of the Apple Music presentation wasn’t the redesign. Rather, it was Bozoma Saint John, the head of Apple’s consumer marketing, who presented the demo. Saint John is the first woman of colour to take the stage at an Apple keynote. She made quite an impact, encouraging the room full of developers to rap along to the Sugarhill Gang’s “Rapper’s Delight” and showing off her dance moves. While Saint John had her moment in the spotlight, Jimmy Iovine, the head of Apple Music, was nowhere to be found. In case you’re wondering: out of ten presenters, four of them were women. Bozoma Saint John just stole the #WWDC2016 show. She’s in a different league. bozoma saint john should do every presentation everywhere ever. They should have used this lady to introduce Apple Music to begin with. 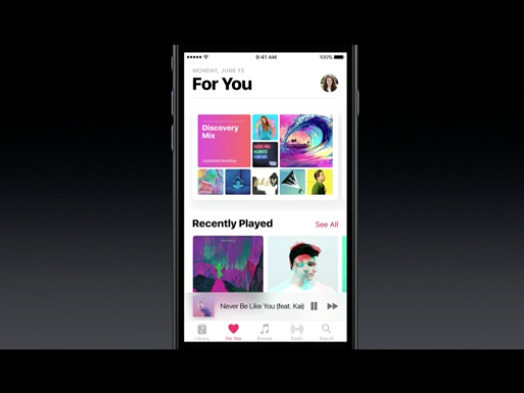 We look forward to trying the new version of Apple Music as soon as it becomes available. iOS 10 is currently available for developers, and there will be an open beta of the software in July.